Armed with warm inviting tones and melodies Trevor Petrie is a songwriter and performer from Bendigo, Victoria. Having grown up in the nearby town of Kyneton - a small regional town which in the early 90's had an abnormally high youth suicide rate, Trevor turned to music as a way to deal with his struggles and teenage emotions. Trevor has been a part of the Bendigo music scene since the early 2000's, most notably as principle songwriter and lead singer in the alternative rock band "Anti Social Commentary". 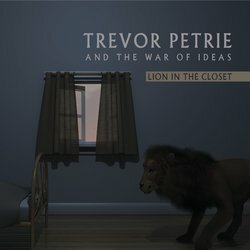 In 2015, Trevor released his debut solo EP "Lion in the Closet" under the name "Trevor Petrie and The War of Ideas" - a Castlemaine based folk rock trio. Trevor's current project "The War of Ideas" builds upon the indie-folk theme with the band now a 5 piece outfit. Trevor is also the owner of Bendigo's indie record label "Poppet Head Records". A boutique label catering mostly to self-managed singer-songwriters. Lion In the closet describes Trevor’s journey in overcoming depression; from admitting there is a problem to finally breaking the negative cycle.